Privateers! might be what you are looking for! It takes place in setting filled with a healthy mix of endless possibilities, absurdities, horror, action, history and adventure. Plays equally well regardless of the number of players and the possibility to play solo, in teams or cooperative makes the game appeal to different types of players. Make it your goal to beat the game at ever increasing difficulty. Band together with your friends or family to defeat a nasty AI opponent. Or use your wit against your gaming buddies. Privateers! is designed to engage players and make it possible to win through numerous strategies. Viable game styles include trading, piracy, colony raids, adventuring and warfare. Modular map tiles allows for countless game board combinations. Explore a new part of the Caribbean every game. Dynamic game structure allowing for endless expansion and development, both by us and hobbyists. All this gives extreme replayability where each game is unique. Privateers! is a heavily thematic cooperative/team/solo board game of piracy and adventure on the high seas. For one to six players. Privateers! is a cooperative / team / solo pirate adventure board game on an alternate Earth overrun by monsters, magic, Atlantean relics, aliens, demons and cultists of the Old Gods. 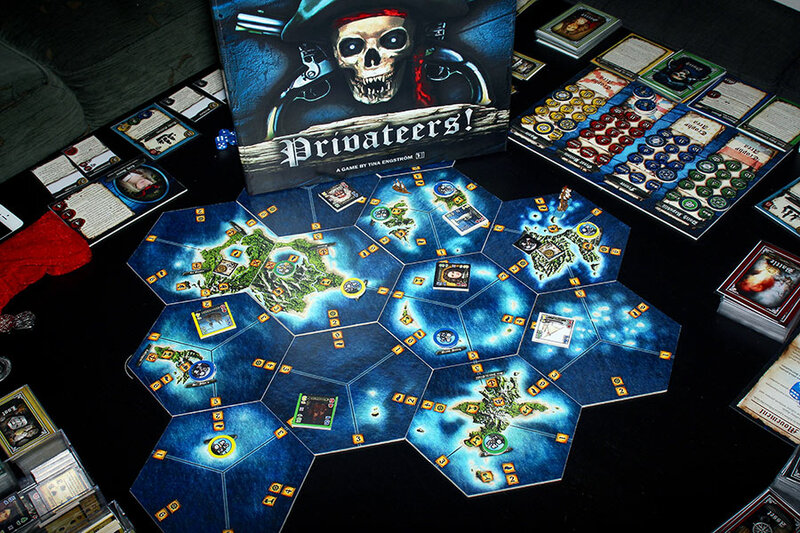 Players control privateer captains with ship and crew. They fight each other, or the game with its great fleets and numerous supernatural allies. Captains battle the enemy navies, fight infamous pirates, explore old ruins, raid settlements, trade and generally have a good time in the port cities of the New World. The better ship, crew and equipment they get, the more powerful they become, but sooner or later they will have to face the best the enemy can muster!. Your help will allow this incredible game to become a reality! So much passion have gone into this project that it deserves to be released. Use our Promotion Tool to tell your friend and earn promotion sets! Myling Games launches Kickstarter campaign to finance the first true high seas pirate adventure board game that can be played cooperatively. The campaign’s fundraising goal will allow Myling Games to professionally print the game and ship it to backers. The funding levels giving backers the core game, will also give an exclusive booster pack with a bunch of cool and strange bonus cards as a token of appreciation. The higher funding levels will even give backers an extra booster pack focusing on the buccaneers of the 17th century, as well as the chance to contribute to the game in different ways. The tiers are setup to make it easy for international purchasers and groups to get the game. We at Myling Games are happy to announce that our big boardgame project, Privateers!, now is live on Kickstarter. The game has been under development for the last four years. But now, in cooperation with Gamerati and SagaGames, it is finally time to finance the project. Yvonne Undin (yvonne.undin (at) mylingspel.se): Customer service and information. Ellen Svensson (ellen (at) mylingspel.se): Customer service and information. The Kickstarter will launch on October 6 at 18:00 GMT / 20:00 CET / 2:00 PM EST / 11:00 AM PST and end November 3. An earlybird pledge levels is available for slightly lower cost. Earlybird backers also get their names in the rules booklet. So, get ready! This page and its contents are © 2014 Myling Games, all rights reserved. You may use texts and pictures for news coverage, blogg posts and similar. Not for commercial use.